Once equipment was obtained the task of uniforms was the next challenge. With slim finances the group had to have every individual purchase their own uniforms with their own personal finances. The original uniform worn the first season was army brown, not camouflaged, khaki's with a field hat. 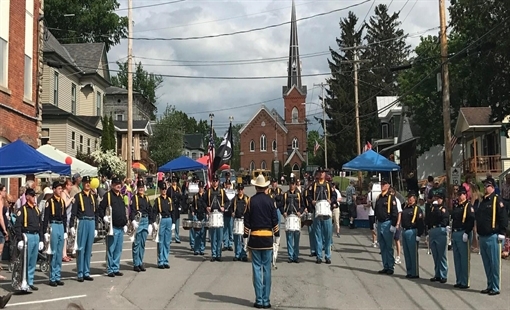 The khaki's were worn by a very proud group who performed so well at the St. Lawrence County Fair in August 1957 that they were disqualified from prizes because the judges thought they were a professional unit from then nearby Camp Drum (now Fort Drum). Despite explanations this ruling never got changed. Needless to say the incident greatly stimulated the urgency and need to have a different uniform. With member and community input a committee searched for ideas for a truly unique uniform that could be remembered. After current trend and historical reviews the group picked the "Yanks" uniform using a copy of style worn by the units from this area during the Civil War. After picking our "Original Yanks" Civil War uniform the group also purchased each member a jacket similar to what our current day director wears. Depending on the type of function the jackets were worn to make up a Class A uniform. 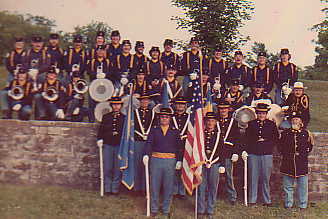 In the original corps all members were residents of Antwerp and numbered 20 with Donald LaLone as director. The corps was governed by a five man Board of Directors that made all financial decisions. The corps went to an elected officer system in 1960 until the late 1980's. In 1988 the corps returned to a Board of Directors for operations and management.